This is the Last of the MacRae 60s "Operetta" series. He who kept the flame of operetta alive in the 50s and 60s would never record operetta again. It was recorded one year after "The New Moon". Gordon's voice had become very heavy in the year and this is noticeable on his every track. Yet he performs magnificently. 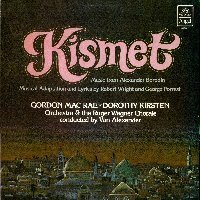 "Kismet" was created by George Wright and Robert Forrest from the colourful classical music of Russian composer Alexander Borodin. This was something they did on stage with other classical composers - Greig in "Song of Norway" (best song "Strange Music") and the Strauss family "The Great Waltz" (not the film). 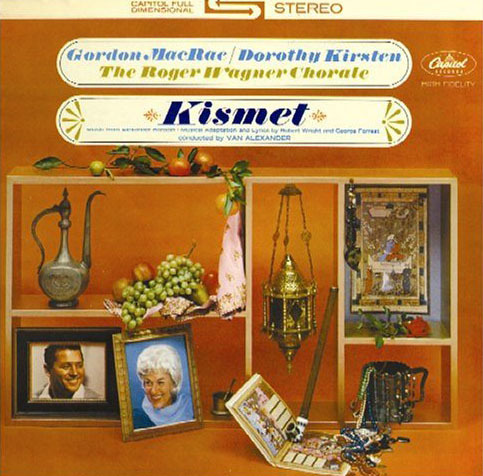 Kismet was decidedly "risque" for 1953 when it was staged and so it is a marked departure from the repressed passions of the Romberg operettas. It depicts one action packed day in the life of a poet-beggar (Hajj) in what is a comedy of errors. It was filmed by MGM with Howard Keel and Ann Blyth and Vic Damone in 1955-6. Its stereo CD has only recently been released. Prior to that only a mono version was available. The Director Vincente Minelli seemed to treat the whole movie as a parody with the art design including ridiculous turbans and costumes. Howard Keel was excellent in what could only be a hammy role but his vocal qualities could not equal that of Gordon's vocal harmonics. In the stage musical, there were several main characters. However Gordon sings two parts - Hajj, a baritone (originally played by Alfred Drake who was the original stage "Curly" in "Oklahoma" and also was the original star in "Kiss Me Kate") and a light-baritone/tenor (originally Richard Kiley later the "Man Of La Mancha" in which he starred with Joan Diener who was Lalume in the original "Kismet"). To tell the truth the dual role is a bit of stretch. He sounds like Marsinah's father. He does not sound like the young Caliph who falls in love with Marsinah and it takes a leap of faith to admit the chacterisations. Nevertheless his singing is excellent. Dorothy plays the part of Hajj's daughter Marsinah (played by Doretta Morrow on stage.) Her voice is suitably girlish and fresh. This recording does not have all the songs from the stage version - "Gesticulate" (a tour de force for Hajj), "Rahadlakum" (a tedious song), "I Was The Wazir" (a silly song) and "He's In Love" (an excellent song) are missing here. 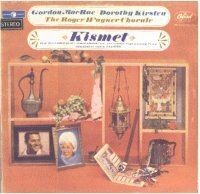 Since there is no "earlier" Gordon edition of Kismet, the recordings which this one will be compared with is the English Decca / "London" Phase 4 recording from 1963 with Robert Merrill (American principal baritone with the Metropolitan Opera), Kenneth MacKellar (Scottish tenor The Caliph), Adele Leigh (English soprano), Ian Wallace (baritone Wazir) and Regina Resnick (American mezzo), and the orchestra conducted by Mantovani about the same time (1963) as this stereo recording. I do not have access to the original Doretta Morrow / Alfred Drake stage version but I heard it some 20 years ago. It must be said that the mono stage version of 1953 was outstanding for its dramatic and comedic flair and remains the artistic benchmark. As can be seen the five major characters of the stage have been reduced to Gordon and Dorothy (and Bunny Bishop and Salli Terri from the Chorale). The Overture with its complex rhythms and orchestration is played by Van Alexander with extraordinary mastery and his command of the considerable orchestral forces here suggest that he could have been a fine classical conductor. The Overture leads into the "Sands Of Time" with three magnificent voices from the Roger Wagner Chorale calling out prayers as muesims, an absolutely spine-tingling display of vocal virtuosity, before Richard Levitt takes up the main song. The singers all convey the Middle Eastern/Arabian sound beautifully. Wonderfully recorded. "Rhymes Have I", with Gordon and Dorothy as father and daughter poet / beggars, is very Gilbert and Sullivan in its play on words and they execute it snappily with verve and humor much better than the London /English Decca recording and equal to the stage version. "Not Since Nineveh" is a risque musing upon the availability of opportunities for sinning in Baghdad. 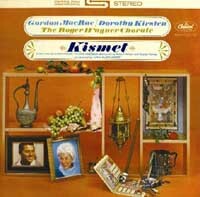 (I wonder if Kismet has ever played in Baghdad). Bunny Bishop does an extraordinary job of conveying cynical, mischievous, brittleness in her "enticing" outline of the multitude of avenues for eternal damnation. The song is meant to be a genre parody and she finishes the song off with a pseudo-Middle East vocal cadenza. Very comical. Very impressive and equal to all and surpassing the British effort. "Baubles, Bangles and Beads", (the Kirby Stone Four had a hit with this), is sung by Dorothy Kirsten and she conveys very effectively a girlish wonderment at the offerings of the marketplace and how true love may come to her. She is excellent but the song is 'stolen' by the Roger Wagner Chorale. Their vocal work, particularly the clarity and the dramatic seductiveness they convey in their tone, surpasses all other versions (English supporters of the Sammes singers may be surprised to hear this). Their work in the introduction is evocative and tempting. Their 'back-up' of Dorothy is exquisite and convincing. "Stranger In Paradise" had been a minor hit for Gordon as a torch song in 1953, though not reaching the popularity heights of the Tony Bennett version. On the stage it is supposed to be sung by Marsinah and the disguised Caliph, a young man. Here, with his darker and hoarser voice, Gordon cannot be regarded as a convincing young Caliph in terms of the requirements of the musical play. (Kenneth MacKellar's tenor is preferable). However in musical terms of 'selling the song', Gordon and Dorothy do very well, particularly in developing a dramatic swell in the tempi and phrasing of the song. It is not a version to be disregarded. "Night Of My Nights" is a song by the young Caliph (Gordon again) in anticipation of the delights of his wedding night. Despite his older voice, Gordon performs convincingly with a hint of salaciousness. However the Roger Wagner Chorale again steal the song with their excellent work. They really do have a joyous sound and their harmonies are clear and dramatically convincing. "And This Is My Beloved" is supposed to be a quartet sung by Marsinah, Haji, The Caliph and the Wazir with overlapping melody lines which end with a strong finale by Marsinah. It is a difficult quartet which is well sung in the stage and English Decca disks. In this version the song has been reduced to a duet between (it seems) father and daughter (Gordon and Dorothy) with the lines redistributed. As such it is not a valid representation of the musical play. However as a duet it is very moving. It conveys an enormous sadness and a sense of loss. The "Olive Tree" is a hymn of praise to entrepreneurial spirit and a condemnation of those who 'see the glass as half-empty'. Once again Gordon is not as stagey as Drake or Keel but he is far more convincing with his use of dynamics. His interpretation of the swelling phrase "I walked from behind the Olive Tree; With a wondrous change in me" conveys the philosophical transformation the Hajj chracter had undergone so many years before. The final phrase "The word is a fool" is devastating in its sad contempt. It is the bench mark. Zabbedita / Samaris Dance is a send-up of seductive dances that are used by various candidates for the Caliph's hand in marriage. The wordless Chorale and Salli Terri execute the songs with flair, electricity and humor. Most impressive, the best of all recordings. The Finale with the Cast is beautifully recorded with Gordon singing "Sands of Time" completely, a wonderful pensive version, and then fading into the distance. Fitting really, as this was the last time he would ever record the operetta genre. Of all four in the "MacRae 60s Operetta" series, this seems to be the most aurally vivid "bright" and sumptuous. It is clearly "exotic" and the orchestrations are vivid and exciting. No less impressive is the work of the recording engineers in the orchestral work, the spread and colour of the Roger Wagner Chorale' s sound. It all has an extraordinary opulence of sound. The Chorale voices are treated handsomely in this recording, by far the best of all their MacRae Operetta recordings with a good aural spread, a bright sound and allowing the clarity of their exceptional diction to reach the listener. Their singing is superb, outclassing the competition for volume, clarity, variety of harmony and dramatic authenticity. Van Alexander's conducting is outstanding. He performs here to a classical standard, far surpassing the classically trained Mantovani, whilst exhibiting a Broadway flair.